Successful training launch by the Royal Air Force with the USAF 392nd Squadron acting as instructors. This launch was from the launch complex that consisted of launch pads 6, 7 and 8. During this time we were using all three launch pads for RAF training. This was the fourth RAF Thor training launch. Launch date was August 3, 1959. American orbital launch vehicle. Single stage vehicle adapted from Thor IRBM with no upper stage. Status: Retired 1958. First Launch: 1957-01-26. Last Launch: 1958-08-06. Number: 18 . Thrust: 667.20 kN (149,993 lbf). Gross mass: 49,340 kg (108,770 lb). Height: 22.00 m (72.00 ft). Diameter: 2.44 m (8.00 ft). Apogee: 520 km (320 mi). Those days I worked for Rocketdyne as the manager in England of Project Emily. Our mission: get 60 Thors aimed at Khrushchev's privates. Things were going badly for lots of reasons, many of them lack of earnest concentration by many Americans in corporations as well as USAF. I was p....d and often loudly said so. One day a dignified, little American man came to me at Feltwell, Cambridgeshire, England, site of the first squadron (if we could ever get it installed and checked out) and told me he heard I was the one to talk to find out what was wrong. I was bad on names then, in my youth and so for hours as I laid it on him, I did not realize until late in the day I was talking to the American Secretary of Defense, Charlie Wilson. Thereafter things improved. After a few years the Thors were withdrawn from Britain (and the Jupiters from Turkey) as part of the secret codicil of Kennedy's deal to end the Cuban Missile Crisis. Development Cost $: 500.000 million. Launch Price $: 4.930 million in 1958 dollars. Flyaway Unit Cost 1985$: 0.750 million in 1958 dollars. Total Development Built: 64. Total Production Built: 160. Stage 1. 1 x Thor DM-19. Gross Mass: 49,340 kg (108,770 lb). Empty Mass: 3,125 kg (6,889 lb). Thrust (vac): 758.711 kN (170,565 lbf). Isp: 282 sec. Burn time: 165 sec. Isp(sl): 248 sec. Diameter: 2.44 m (8.00 ft). Span: 2.44 m (8.00 ft). Length: 18.42 m (60.43 ft). Propellants: Lox/Kerosene. No Engines: 1. Engine: LR-79-7. Status: Out of Production. Family: orbital launch vehicle. Country: USA. Spacecraft: DMSP Block 4A. Launch Sites: Cape Canaveral, Cape Canaveral LC17B, Cape Canaveral LC17A, Cape Canaveral LC18B. Stages: Thor DM-19. Agency: Douglas. 1957 January 26 - . Launch Site: Cape Canaveral. Launch Complex: Cape Canaveral LC17B. LV Family: Thor. Launch Vehicle: Thor DM-18. FAILURE: Lox contamination, led to a valve failure. Thrust decayed, the booster settled back through the thrust ring, causing an oxygen fire, followed by booster explosion.. Failed Stage: 1. Series I research and development launch - . Nation: USA. Agency: USAF. Apogee: 0 km (0 mi). First attempted test flight of USAF Thor IRBM, only 13 months after first production contracts were signed, failed to launch. The first attempt failed when the vehicle lost thrust immediately after liftoff..
1957 April 20 - . 04:33 GMT - . Launch Site: Cape Canaveral. Launch Complex: Cape Canaveral LC17B. LV Family: Thor. Launch Vehicle: Thor DM-18. FAILURE: Console wiring error resulted in erroneous tracking indication; destroyed by range safety.. Failed Stage: G.
Series I research and development launch - . Nation: USA. Agency: USAF. Apogee: 0 km (0 mi). The second Thor flight test missile launched on the Atlantic Missile Range (AMR) was successful until the Range Safety Officer (RSO) accidentally destroyed the missile. Douglas Thor IRBM (XSM-75) was launched at Cape Canaveral, Fla., destroyed by range safety officer. The missile was actually on course throughout its flight. The console wiring error led the range safety officer to believe it was headed inland rather than out to sea, so he hit the destruct button. 1957 May 22 - . 03:00 GMT - . Launch Site: Cape Canaveral. Launch Complex: Cape Canaveral LC17B. LV Family: Thor. Launch Vehicle: Thor DM-18. Research and development Series I (padex) test - . Nation: USA. Agency: USAF. Apogee: 0 km (0 mi). 1957 August 30 - . Launch Site: Cape Canaveral. Launch Complex: Cape Canaveral LC17A. LV Family: Thor. Launch Vehicle: Thor DM-18. FAILURE: Failure. Failed Stage: 1. Series I research and development launch - . Nation: USA. Agency: USAF. Apogee: 0 km (0 mi). The fourth Thor (#104) missile broke up and exploded 96 seconds into its flight. .
1957 September 20 - . Launch Site: Cape Canaveral. Launch Complex: Cape Canaveral LC17B. LV Family: Thor. Launch Vehicle: Thor DM-18. Series I research and development launch - . Nation: USA. Agency: USAF. Apogee: 520 km (320 mi). First fully successful test flight of Thor intermediate range ballistic missile. (AF Ballistic Missiles Program Status Report.) After four failures, the fifth Thor flight test missile (#105) successfully demonstrated all on-board systems. The engine operated 137 seconds to automatic shutdown, and missile impacted 1,300 nautical miles down range from Cape Canaveral. Complete USAF Thor IRBM first successfully launched from Cape Canaveral. Dummy Warhead sent to 1800 km range. 1957 October 3 - . 17:13 GMT - . Launch Site: Cape Canaveral. Launch Complex: Cape Canaveral LC17A. LV Family: Thor. Launch Vehicle: Thor DM-18. FAILURE: Failure. Failed Stage: 1. 1957 October 11 - . 16:33 GMT - . Launch Site: Cape Canaveral. Launch Complex: Cape Canaveral LC17B. LV Family: Thor. Launch Vehicle: Thor DM-18. FAILURE: Turbopump gearbox failure..
Series I research and development launch - . Nation: USA. Agency: USAF. Apogee: 520 km (320 mi). The second successful Thor flight test missile was launched from Cape Canaveral, Florida, and attained its design range of 1,500 miles. Thor missile launched at Cape Canaveral, the second tested, achieved its designed 1,500-mile range..
1957 October 24 - . 16:32 GMT - . Launch Site: Cape Canaveral. Launch Complex: Cape Canaveral LC17A. LV Family: Thor. Launch Vehicle: Thor DM-18. Series I research and development launch - . Nation: USA. Agency: USAF. Apogee: 520 km (320 mi). In its first long-range flight, a Thor missile launched from Cape Canaveral completed a 2,645-mile flight down the Atlantic Missile Range. Stripped down Thor long-range flight test successful from AMR, impacting 4400 km downrange..
1957 December 7 - . 22:11 GMT - . Launch Site: Cape Canaveral. Launch Complex: Cape Canaveral LC17B. LV Family: Thor. Launch Vehicle: Thor DM-18. Research and development Series II test - . Nation: USA. Agency: USAF. Apogee: 520 km (320 mi). 1957 December 19 - . 20:12 GMT - . Launch Site: Cape Canaveral. Launch Complex: Cape Canaveral LC17A. LV Family: Thor. Launch Vehicle: Thor DM-18. The eighth Thor flight test missile, the fourth success, completed the first fully-guided flight using an all-inertial guidance and control system. A Thor missile, the eighth tested and the fourth successfully, completed the first fully-guided Thor IRBM flight using an all-inertial guidance system. 1958 January 28 - . 20:16 GMT - . Launch Site: Cape Canaveral. Launch Complex: Cape Canaveral LC17A. LV Family: Thor. Launch Vehicle: Thor DM-18. FAILURE: Failure. Failed Stage: 1. Research and development Series II test - . Nation: USA. Agency: USAF. Apogee: 0 km (0 mi). Thor IRBM successfully fired from Cape Canaveral, flew prescribed course, and impacted in preselected area..
1958 February 28 - . 13:08 GMT - . Launch Site: Cape Canaveral. Launch Complex: Cape Canaveral LC17B. LV Family: Thor. Launch Vehicle: Thor DM-18. FAILURE: Failure. Failed Stage: 1. Research and development Series II test - . Nation: USA. Agency: USAF. Apogee: 0 km (0 mi). Copper heatsink nose cone. 1958 April 19 - . 13:30 GMT - . Launch Site: Cape Canaveral. Launch Complex: Cape Canaveral LC17B. LV Family: Thor. Launch Vehicle: Thor DM-18. FAILURE: Failure. Failed Stage: 1. Research and development Series II test - . Nation: USA. Agency: USAF. Apogee: 0 km (0 mi). 1958 June 4 - . 21:17 GMT - . Launch Site: Cape Canaveral. Launch Complex: Cape Canaveral LC18B. Launch Pad: LC18B. LV Family: Thor. Launch Vehicle: Thor DM-18. Research and development Series III test - . Nation: USA. Agency: USAF. Apogee: 520 km (320 mi). 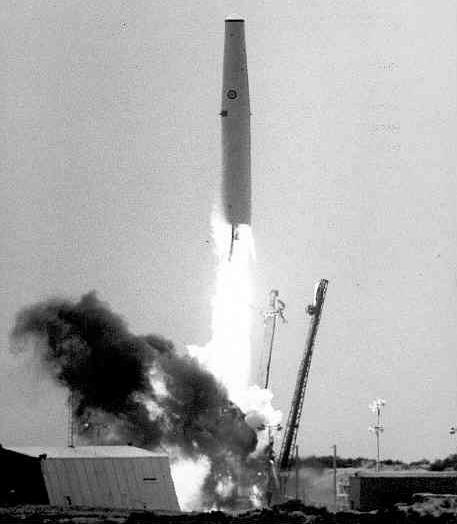 The first Air Force Thor IRBM flight test missile (Number 115) to be fired from a tactical-type launcher was launched at Cape Canaveral. The missile completed a successful flight, impacting 1,170 nautical miles downrange. This was also the first Thor to be launched without a flight readiness firing of its propulsion system. USAF Thor flight tested for the first time from a tactical-type launcher at Cape Canaveral. 1958 June 13 - . 15:06 GMT - . Launch Site: Cape Canaveral. Launch Complex: Cape Canaveral LC17B. LV Family: Thor. Launch Vehicle: Thor DM-18. 1958 July 13 - . 06:36 GMT - . Launch Site: Cape Canaveral. Launch Complex: Cape Canaveral LC17B. LV Family: Thor. Launch Vehicle: Thor DM-18. 1958 July 26 - . 06:40 GMT - . Launch Site: Cape Canaveral. Launch Complex: Cape Canaveral LC17B. LV Family: Thor. Launch Vehicle: Thor DM-18. FAILURE: Failure. Failed Stage: 1. Research and development Series III test - . Nation: USA. Agency: USAF. Apogee: 0 km (0 mi). 1958 August 6 - . Launch Site: Cape Canaveral. Launch Complex: Cape Canaveral LC18B. Launch Pad: LC18B. LV Family: Thor. Launch Vehicle: Thor DM-18. Research and development Series III test - . Nation: USA. Agency: USAF. Apogee: 520 km (320 mi). The last of 18 Thor research and development flight test missiles was launched from Cape Canaveral. Only seven of the 18 launches were categorized as successes while 11 were failures. .